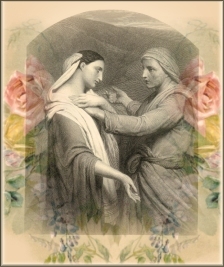 "And Ruth said, Intreat me not to leave thee, or to return from following after thee: for whither thou goest, I will go; and where thou lodgest, I will lodge: thy people shall be my people, and thy God my God:  Where thou diest, will I die, and there will I be buried: the LORD do so to me, and more also, if ought but death part thee and me." The books of reference used for this study of the book of Ruth were the Bible, King James Version, called "The Companion Bible", Publisher Kregel; Strong's Exhaustive Concordance of the Bible, numbered to the Hebrew, Chaldee, and Greek, and English, coded to the Strong's Concordance numbers. "Sympathy with Naomi, in Grief [19-22]." Chapter 2 "Boaz and Ruth." Chapter 3 "Ruth and Boaz, Claim of Kinsman." Chapter 4 "The Claim of Kinsman, Fulfilled [1-13]." "Sympathy with Naomi, in Joy [14-17]." "Elimelech's Family. The Uplifting [17-22]."